World-renowned heavy earth-moving manufacturer Caterpillar has boosted the outlook of heavy vehicle apprentices studying at Charles Darwin University with a substantial donation of equipment. 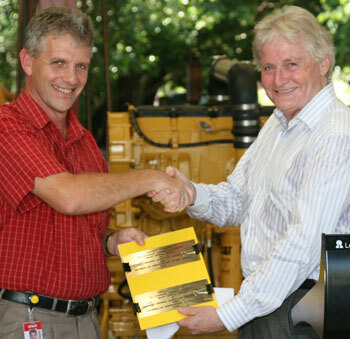 Hastings Deering Australia, distributor of Caterpillar heavy equipment, have donated two, state-of-the-art Caterpillar C18 engines valued at $75,000 each for the use of CDU’s heavy vehicle mechanics. The handover took place on Tuesday, 11 December. The Caterpillar C18 engines, worth a combined $150,000, are used in the Caterpillar's AD55 Underground Articulated Truck designed for high-production hauling in large underground mining applications. Coordinator and lecturer in the heavy vehicle program in the School of Trades, David Smith said the University’s continued partnership with Hastings Deering and Caterpillar was key to CDU’s heavy vehicle apprentices. “We currently have an unrivalled level of online technical support from Caterpillar which we use as an educational resource for trainees and apprentices,” he said. Features of the 650 horse power C18 engine include the electric management system and Caterpillar’s breakthrough emission control technology. The latest donation brings the number of Caterpillar engines donated to CDU to five, with previous donations including gearboxes, transmissions, hydraulic pumps, hydraulic cylinder rods and fuel injection pumps. “It is great to see companies of the scale of Caterpillar and Hastings Deering supporting CDU’s apprentices and trainees by providing them with the resources currently in use in the heavy vehicle industry,” Mr Smith said.